I wrote my first blog post about mindful eating in 2008. Since then I've written several more posts and an entire book (Things I Did When I Was Hangry: Navigating a Peaceful Relationship with Food) about mindful eating. Eating is not just something I love to do, but something about which, clearly, I am conflicted. I ate vegetarian style for more than 25 years, vegan for two, and meat eating in various amounts for the remainder. I've studied nutrition and food, both formally and informally. Once, I brought together a panel of experts: a Buddhist monk who was an animal rights activist, a Native American college professor researching traditional diets, a vegan doctor, a bone broth expert, and the author of The Mindful Carnivore to discuss what we should be eating. 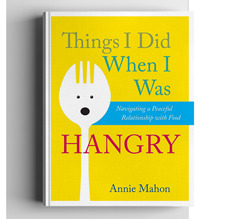 I won't bore you with all of the other wacky ways I've tried to understand how my mindfulness practice applies to my need to eat. I'll be honest, I'm eating right now as I write this blog post. Mindful eating is pleasurable. If you aren't enjoying eating, you're probably not doing it. It's not about trying hard and definitely not about misery. Mindful eating doesn't have anything to do with body size. Mindful eating doesn't help you lose weight, gain weight, or keep your weight the same. Mindful eating and weight are like apples and Mazdas, they are completely unrelated. Unfortunately, our fat phobic, body shaming culture has hijacked the term "mindful eating" and you may find it used to keep people's bodies (mostly women's) at a certain acceptable size. Please know that this is not mindful eating. The correct word for this is dieting - you may have heard of it. Mindful eating is a concept, and concepts, like the North Star, can help direct us, but they are never the place we are really trying to get to. The place we are aiming for is ineffable, but it has something to do with pleasure and ease and connection and all of the juicy ways humans can experience life. Mindful eating -- like anything really -- can be used as a weapon against others, or more often against ourselves. Judging our eating as mindful or unmindful is exactly not the point. Enjoying food can't be done when we are deep into self-hatred, body shame, or self-judgment. Mindfulness is all about choice. Likewise, mindful eating means you are in choice. You are not being driven or coerced into eating, you are making moment-to-moment choices about what and how you want to eat. It's especially important that you are making those choices, not someone else. So where has all this left me? In a classically Zen way, I feel I am back to the beginning. Long before I wrote blogs about mindful eating, before I knew what mindful eating was, before I was a vegetarian, before I hated my body and tried to change it by throwing up, before all of that, I knew how to eat. There's a story I've heard many times about an ancient Zen master who was asked, "What is enlightenment?" He answered, "When hungry, eat. When tired, sleep." We all knew how to do that at one time, right? If there is anything I might add to that complete Zen teaching, it's just what I've learned from the living Zen master, Thich Nhat Hanh. His way of eating and living is based on a kind of gentleness, regarding everything as precious. When we walk, our feet are kissing the earth, and when we do the dishes, we do it as if we are bathing a baby. It's all about love. When we eat, we eat in a way that demonstrates love for ourselves and for the world. As best we can right now. Period. So, celebrate your food, eat with love for yourself and all beings. Eat joyfully, gratefully, even heartily. Trust yourself. You already know how.